How did you get involved with the TARGET program? A little over a year ago, I attended a few of the Saturday Morning Physics lectures and heard about the TARGET program. I decided to apply and was accepted into the program. What is your role in the Python programming course? 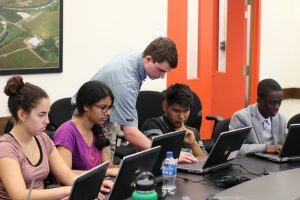 As a TARGET student last year, I worked with Ruth Pordes, my supervisor, along with Nate Knauf, another intern outside of the TARGET program, to create a Python course for other TARGET students. Nate Knauf and I created the teaching materials, and Ruth supervised the class. By the end of the program, every student had a solid understanding of the Python language. This year, I was able to come back as an extended intern. I am now working with my new supervisor Marco Mambelli, the technical lead on the GlideinWMS project. The Python course is being given again this year, and Marco and I are leading it. It has been a lot of fun, and I look forward to each class. I am currently focused on the GlideinWMS project, updating the code base from an older version of Python to be compatible with Python version 3.6. What are you planning on doing when you leave Fermilab? I will be attending the University of Illinois at Chicago this fall, majoring in computer science. I hope to study machine learning and take some classes in electrical engineering as well. It’s a great atmosphere to work in, and the people here are amazing. This has been an incredible experience for me, and I’m glad to come into work every day.